Most unions in the United States are aligned with one of two larger umbrella organizations: the AFL-CIO created in 1955, and the Change to Win Federation which split from the AFL-CIO in 2005. Both advocate policies and legislation on behalf of workers in the United States and Canada, and take an active role in politics. 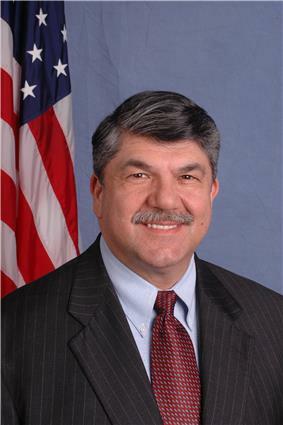 The AFL-CIO is especially concerned with global trade issues. In 2013 there were 14.5 million members in the U.S., compared with 17.7 million in 1983. In 2013, the percentage of workers belonging to a union in the United States (or total labor union "density") was 11.3%, compared to 20.1% in 1983. From a global perspective, the density in 2010 was 11.4% in the U.S., 18.4% in Germany, 27.5% in Canada, and 70% in Finland. Union membership in the private sector has fallen under 7% — levels not seen since 1932. In the 21st century the most prominent unions are among public sector employees such as city employees, government workers, teachers and police. Members of unions are disproportionately older, male, and residents of the Northeast, the Midwest, and California. Union workers average 10-30% higher pay than non-union in the United States after controlling for individual, job, and labor market characteristics. Although much smaller compared to their peak membership in the 1950s, American unions remain a political factor, both through mobilization of their own memberships and through coalitions with like-minded activist organizations around issues such as immigrant rights, trade policy, health care, and living wage campaigns. Of special concern are efforts by cities and states to reduce the pension obligations owed to unionized workers who retire in the future. Republicans elected with Tea Party support in 2010, Most notably Governor Scott Walker of Wisconsin, have launched major efforts against public sector unions due in part to state government pension obligations along with the allegation that the unions are too powerful. Unions began forming in the mid-19th century in response to the social and economic impact of the industrial revolution. National labor unions began to form in the post-Civil War Era. The Knights of Labor emerged as a major force in the late 1880s, but it collapsed because of poor organization, lack of effective leadership, disagreement over goals, and strong opposition from employers and government forces. The American Federation of Labor, founded in 1886 and led by Samuel Gompers until his death in 1924, proved much more durable. It arose as a loose coalition of various local unions. It helped coordinate and support strikes and eventually became a major player in national politics, usually on the side of the Democrats. American labor unions benefitted greatly from the New Deal Coalition. Pro-business conservatives gained control of Congress in 1946, and in 1947 passed the Taft-Hartley Act, drafted by Senator Robert A. Taft. President Truman vetoed it but the Conservative coalition overrode the veto. The new law (still in effect today) banned union contributions to political candidates, restricted the power of unions to call strikes that "threatened national security," and forced the expulsion of Communist union leaders. The unions campaigned vigorously for years to repeal the law but failed. During the late 1950s, the Landrum Griffith Act of 1959 passed in the wake of Congressional investigations of corruption and undemocratic internal politics in the Teamsters and other unions. The percentage of workers belonging to a union (or "density") in the United States peaked in 1954 at almost 35% and the total number of union members peaked in 1979 at an estimated 21.0 million. Membership has declined since (currently 14.5 million and 11.3% of the labor force). Private sector union membership then began a steady decline that continues into the 2010s, but the membership of public sector unions grew steadily (now 37%). Campbell, D'Ann. "Sisterhood versus the Brotherhoods: Women in Unions" Women at War With America: Private Lives in a Patriotic Era (1984). Dubofsky, Melvyn and Warren Van Time John L. Lewis (1986). Fraser, Steve. Labor Will Rule: Sidney Hillman and the Rise of American Labor (1993). Kennedy, David M. Freedom From Fear: The American People in Depression and War, 1929-1945. (1999) recent narrative. ^ See Trade Union Density OECD. StatExtracts. Retrieved: 17 November 2011. ^ Alicia H. Munnell (2012). State and Local Pensions: What Now?. Brookings Institution Press. pp. 4–5. ^ Nelson Lichtenstein, "Can This Election Save the Unions?," Summer 2012Dissent. ^ William H. Holley et al.Jr. (2011). The Labor Relations Process, 10th ed.. Cengage Learning. p. 85. ^ David Scott Witwer (2003). Corruption and Reform in the Teamsters Union. University of Illinois Press. p. 131ff. ^ This includes some people who are covered by union contracts but are not themselves members. ^ Bureau of Labor Statistics, "Table 3. Union affiliation of employed wage and salary workers by occupation and industry"
^ Susan Margaret Collins (1998). Imports, Exports, and the American Worker. Brookings Institution Press. pp. 288–90. ^ Frank Levy, Larry Mishel and Jared Bernstein (1996). Running in Place: Recent Trends in U.S. Living Standards. DIANE Publishing. pp. 53–56. ^ James Charles Cobb and William Whitney Stueck (2005). Globalization and the American South. U. of Georgia Press. p. 41. ^ a b Carter A. Wilson (2013). Public Policy: Continuity and Change, Second Edition. Waveland Press. pp. 256–57. ^ a b Aaron Brenner et al. (2011). The Encyclopedia of Strikes in American History. M.E. Sharpe. pp. 234–35. ^ James T. Bennett and Bruce E. Kaufman (2002). The Future of Private Sector Unionism in the United States. M.E. Sharpe. pp. 373–78. ^ Theda Skocpol; Vanessa Williamson (2012). The Tea Party and the Remaking of Republican Conservatism. Oxford U.P. p. 192. ^ Richard B. Freeman and Eunice Han. "The war against public sector collective bargaining in the US." Journal of Industrial Relations (2012) 54#3 pp: 386-408. Greenhouse, Steven (January 28, 2009). "Union membership up sharply in 2008, report says". Whoriskey, Peter (January 29, 2009). "American union ranks grow after 'bottoming out'; first significant increase in 25 years". ^ Greenhouse, Steven (23 January 2013). "Share of the Work Force in a Union Falls to a 97-Year Low, 11.3%". The New York Times. Retrieved 25 January 2013. ^ Schultz, Duane P. Schultz, Sydney Ellen (2010). Psychology and work today : an introduction to industrial and organizational psychology (10th ed. ed.). Upper Saddle River, N.J.: Prentice Hall. pp. 271–272. ^ Madland, Walter, and Bunker, "As Union Membership Rates Decrease, Middle Class Incomes Shrink. ", AFL-CIO, May 24, 2013. Greenhouse, Steven (January 26, 2008). "Union membership sees biggest rise since ’83". Freeman, Sholnn (January 26, 2008). "Union membership up slightly in 2007; Growth was biggest in Western states; Midwest rolls shrank with job losses". ^ Tapscott, Mark (March 1, 2011). "CBS News/New York Times survey oversampled union households". ^ "Americans' Message to States: Cut, Don't Tax and Borrow". Gallup.com. 2011-03-09. Archived from the original on 13 March 2011. Retrieved 2011-03-13. ^ "Republicans Negative, Democrats Positive in Describing Unions". Gallup.com. Archived from the original on 14 March 2011. Retrieved 2011-03-12. ^ "More Americans Back Unions Than Governors in State Disputes". Gallup.com. Archived from the original on 6 April 2011. Retrieved 2011-04-03. ^ "Approval of Labor Unions Holds Near Its Low, at 52%". Gallup.com. Retrieved 2011-10-28. ^ "New High of 55% of Americans Foresee Labor Unions Weakening". Gallup.com. Retrieved 2011-10-28. ^ Scruggs, L. and Lange, P. (2002) "Where Have all the Members Gone? Globalizations, Institutions, and Union Density," The Journal of Politics 64#1 pp 126–53. ^ Sano, Joelle and John B. Williamson. (2008) “Factors Affecting Union Decline and their Implications for Labor Reform.” International Journal of Comparative Sociology 49: 479-500. ^ Goldfield, Michael. “The impact of globalization and neoliberalism on the decline of organized labour in the United States” in Labor, Globalization and the State: Workers, women and migrants confront neoliberalism ed. by Banerjee, Debdas and Michael Goldfield, (Routledge, 2007). ^ Kate Bronfenbrenner, 'We'll Close', The Multinational Monitor, March 1997, based on the study she directed, '"Final Report: The Effects of Plant Closing or Threat of Plant Closing on the Right of Workers to Organize"'. ^ Bolle, Mary Jane. “DR-CAFTA Labor Rights Issues.” Congressional Research Service Report for Congress Order Code RS22159. 8 Jul 2005. ^ Cameron, Maxwell A. and Brian W. Tomlin. The Making of NAFTA: How the Deal was Done. Ithaca, NY: Cornell University Press, 2000. ^ Graubart, Jonathan. Legalizing Transnational Activism: The Struggle to Gain Social Change from NAFTA’s Citizen Petitions (Pennsylvania State University Press, 2008). ^ O’Brien, Robert. “The varied paths to minimum global labour standards.” Global Unions? Theory and Strategies of organized labour in the global political economy ed by Harrod, Jeffrey and Robert O’Brien, (Routledge, 2002). ^ Rainer Braun, and Judy Gearhart. "Who should code your conduct? Trade union and NGO differences in the fight for workers' rights," Development in Practice 14.1-2 (2004): 183-196. ^ Eder, Mine. “The constraints on labour internationalism: contradictions and prospects.” in Global Unions? Theory and Strategies of organized labour in the global political economy ed Harrod, Jeffrey and Robert O’Brien, (Routledge, 2002). ^ Herod, Andrew. “Organizing globally, organizing locally: union spatial strategy in a global economy.” in Global Unions? Theory and Strategies of organized labour in the global political economy ed Harrod, Jeffrey and Robert O’Brien, (Routledge, 2002). Labor federation competition in the U.S. Unions have made some attempts to organize across borders. Eder observes that transnational organizing is not a new phenomenon but has been facilitated by technological change. Nevertheless, he claims that while unions pay lip service to global solidarity, they still act largely in their national self-interest. He argues that unions in the global North are becoming increasingly depoliticized while those in the South grow politically, and that global differentiation of production processes leads to divergent strategies and interests in different regions of the world. These structural differences tend to hinder effective global solidarity. However, in light of the weakness of international labor, Herod writes that globalization of production need not be met by a globalization of union strategies in order to be contained. Herod also points out that local strategies, such as the United Auto Workers’ strike against General Motors in 1998, can sometimes effectively interrupt global production processes in ways that they could not before the advent of widespread market integration. Thus, workers need not be connected organizationally to others around the world to effectively influence the behavior of a transnational corporation. unions, in the U.S. manner, as the prime way of competing with China and other countries [does not work]. It's no accident that the social democracies, Sweden, France, and Germany, which kept on paying high wages, now have more industry than the U.S. or the UK. … [T]hat's what the U.S. and the UK did: they smashed the unions, in the belief that they had to compete on cost. The result? They quickly ended up wrecking their industrial base. In contrast, activists from the non-governmental sector are motivated by ideals, are free of accountability and gain legitimacy from being political outsiders. Therefore, the interests of unions are not likely to align well with the interests of those who draft and monitor corporate codes of conduct. Braun and Gearhart note that although unions do participate in the structure of a number of these agreements, their original interest in codes of conduct differed from the interests of human rights and other non-governmental activists. Unions believed that codes of conduct would be important first steps in creating written principles that a company would be compelled to comply with in later organizing contracts, but did not foresee the establishment of monitoring systems such as the Fair Labor Association. These authors point out that are motivated by power, want to gain insider status politically and are accountable to a constituency that requires them to provide them with direct benefits. Unions have recently been engaged in a developing field of transnational labor regulation embodied in corporate codes of conduct. However, O’Brien cautions that unions have been only peripherally involved in this process, and remain ambivalent about its potential effects. They worry that these codes could have legitimizing effects on companies that don’t actually live up to good practices, and that companies could use codes to excuse or distract attention from the repression of unions. Graubart writes that, despite unions’ open disappointment with the outcome of this labor-side negotiation, labor activists, including the AFL-CIO have used the side agreement’s citizen petition process to highlight ongoing political campaigns and struggles in their home countries. He claims that despite the relative weakness of the legal provisions themselves, the side-agreement has served a legitimizing functioning, giving certain social struggles a new kind of standing. When it became clear that Mexico would not stand for this kind of an agreement, some critics from the labor movement would not settle for any viable alternatives. In response, part of the labor movement wanted to declare their open opposition to the agreement, and to push for NAFTA’s rejection in Congress. Ultimately, the ambivalence of labor groups led those within the Administration who supported NAFTA to believe that strengthening NAFTA’s labor side agreement too much would cost more votes among Republicans than it would garner among Democrats, and would make it harder for the United States to elicit support from Mexico. During Clinton’s presidential campaign, labor unions wanted NAFTA to include a side deal to provide for a kind of international social charter, a set of standards that would be enforceable both in domestic courts and through international institutions. However, Mayer has written that it was precisely unions’ opposition to NAFTA overall that jeopardized organized labor’s ability to influence the debate on labor standards in a significant way. Regardless of the actual impact of market integration on union density or on workers themselves, organized labor has been engaged in a variety of strategies to limit the agenda of globalization and to promote labor regulations in an international context. The most prominent example of this has been the opposition of labor groups to free trade initiatives such as the North American Free Trade Agreement (NAFTA) and the Dominican Republic-Central American Free Trade Agreement (DR-CAFTA). In both cases, unions expressed strong opposition to the agreements, but to some extent pushed for the incorporation of basic labor standards in the agreement if one were to pass. Studies done by Kate Bronfenbrenner at Cornell University show the adverse effects of globalization towards unions due to illegal threats of firing. Goldfield writes that the overall effects of globalization on unionization in the particular case of the United States may be understated in econometric studies on the subject. He writes that the threat of production shifts reduces unions’ bargaining power even if it does not eliminate them, and also claims that most of the effects of globalization on labor’s strength are indirect. They are most present in change towards a neoliberal political context that has promoted the deregulation and privatization of some industries and accepted increased employer flexibility in labor markets. Studies focusing more narrowly on the U.S. labor movement corroborate the comparative findings about the importance of structural factors, but tend to emphasize the effects of changing labor markets due to globalization to a greater extent. Bronfenbrenner notes that changes in the economy, such as increased global competition, capital flight, and the transitions from a manufacturing to a service economy and to a greater reliance on transitory and contingent workers, accounts for only a third of the decline in union density. Sano and Williamson argue that globalization’s impact is conditional upon a country’s labor history. In the United States in particular, which has traditionally had relatively low levels of union density, globalization did not appear to significantly affect union density. More recently, as unions have become increasingly concerned with the impacts of market integration on their well-being, scholars have begun to assess whether popular concerns about a global “race to the bottom” are reflected in cross-country comparisons of union strength. These scholars use foreign direct investment (FDI) and the size of a country’s international trade as a percentage of its GDP to assess a country’s relative degree of market integration. These researchers typically find that globalization does affect union density, but is dependent on other factors, such as unions’ access to the workplace and the centralization of bargaining. In general, scholars debate the influence of politics in determining union strength in the US and other countries. One argument is that political parties play an expected role in determining union strength, with left-wing governments generally promoting greater union density, while others contest this finding by pointing out important counterexamples and explaining the reverse causality inherent in this relationship. The second effect of Taft-Hartley was subtler and slower-working. It was to hold up any new organizing at all, even on a quiet, low-key scale. For example, Taft-Hartley ended "card checks." … Taft-Hartley required hearings, campaign periods, secret-ballot elections, and sometimes more hearings, before a union could be officially recognized. It also allowed and even encouraged employers to threaten workers who want to organize. Employers could hold "captive meetings," bring workers into the office and chew them out for thinking about the Union. And Taft-Hartley led to the "union-busting" that started in the late 1960s and continues today. It started when a new "profession" of labor consultants began to convince employers that they could violate the [pro-labor 1935] Wagner Act, fire workers at will, fire them deliberately for exercising their legal rights, and nothing would happen. The Wagner Act had never had any real sanctions. So why hadn't employers been violating the Wagner Act all along? Well, at first, in the 1930s and 1940s, they tried, and they got riots in the streets: mass picketing, secondary strikes, etc. But after Taft-Hartley, unions couldn't retaliate like this, or they would end up with penalty fines and jail sentences. Labor lawyer Thomas Geoghegan attributes the drop to the long-term effects of the 1947 Taft-Hartley Act, which slowed and then halted labor's growth and then, over many decades, enabled management to roll back labor's previous gains. Unions have enjoyed higher rates of success in locations where they have greater access to the workplace as an organizing space (as determined both by law and by employer acceptance), and where they benefit from a corporatist relationship to the state and are thus allowed to participate more directly in the official governance structure. Moreover, the fluctuations of business cycles, particularly the rise and fall of unemployment rates and inflation, are also closely linked to changes in union density. The first relevant set of factors relate to the receptiveness of unions’ institutional environments. For example, the presence of a  A broad range of forces have been identified as potential contributors to the drop in union density across countries. Sano and Williamson outline quantitative studies that assess the relevance of these factors across countries. 55% of Americans believed that labor unions will become weaker in the United States as time goes by, an all time high. This compared to 22% who said their power would stay the same, and 20% who said they would get stronger. The majority of Republicans and Independents believed labor unions would further weaken by a 58% and 57% percentage margin respectively. A plurality of Democrats believed the same, at 46%. 42% of Americans want labor unions to have less influence, tied for the all-time high set in 2009. 30% wanted more influence and 25% wanted the same amount of influence. The majority of Republicans wanted labor unions to have less influence, at 69%. A plurality of Independents wanted labor unions to have less influence, at 40%. A plurality of Democrats wanted labor unions to have more influence, at 45%. The majority of Americans believed labor unions mostly helped members of unions by a 68 to 28 margin. A plurality of Americans believed labor unions mostly helped the companies where workers are unionized by a 48-44 margin. A plurality of Americans believed labor unions mostly helped state and local governments by a 47-45 margin. A plurality of Americans believed labor unions mostly hurt the US economy in general by a 49-45 margin. The majority of Americans believed labor unions mostly hurt workers who are not members of unions by a 56-34 margin. 52% of Americans approved of labor unions, unchanged from 2010. 78% of Democrats approved of labor unions, up from 71% in 2010. 52% of Independents approved of labor unions, up from 49% in 2010. 26% of Republicans approved of labor unions, down from 34% in 2010. When asked if they supported the labor unions or the governors in state disputes; 48% said they supported the unions, 39% said the governors, 4% said neither, and 9% had no opinion. Women supported the governors much less than men. 45% of men said they supported the governors, while 46% said they supported the unions. This compares to only 33% of women who said they supported the governors and 50% who said they supported the unions. All areas of the US (East, Midwest, South, West) were more likely to support unions than the governors. The largest gap being in the East with 35% supporting the governors and 52% supporting the unions, and the smallest gap being in the West with 41% supporting the governors and 44% the unions. 18- to 34-year-olds were much more likely to support unions than those over 34 years of age. Only 27% of 18- to 34-year-olds supported the governors, while 61% supported the unions. Americans ages 35 to 54 slightly supported the unions more than governors, with 40% supporting the governors and 43% the unions. Americans 55 and older were tied when asked, with 45% supporting the governors and 45% the unions. Republicans were much more likely to support the governors when asked with 65% supporting the governors and 25% the unions. Independents slightly supported unions more, with 40% supporting the governors and 45% the unions. Democrats were overwhelmingly in support of the unions. 70% of Democrats supported the unions, while only 19% supported the governors. Those who said they were following the situation not too closely or not at all supported the unions over governors, with a 14–point (45% to 31%) margin. Those who said they were following the situation somewhat closely supported the unions over governors by a 52–41 margin. Those who said that they were following the situation very closely were only slightly more likely to support the unions over the governors, with a 49-48 margin. A Gallup poll released on March 11, 2011, showed that nationwide, Americans were more likely to give unions a negative word or phrase when describing them (38%) than a positive word or phrase (34%). 17% were neutral and 12% didn't know. Republicans were much more likely to say a negative term (58%) than Democrats (19%). Democrats were much more likely to say a positive term (49%) than Republicans (18%). A Gallup poll released on March 9, 2011, showed that Americans were more likely to support limiting the collective bargaining powers of state employee unions to balance a state's budget (49%) than disapprove of such a measure (45%), while 6% had no opinion. 66% of Republicans approved of such a measure as did 51% of independents. Only 31% of Democrats approved. A New York Times/CBS Poll found that 60% of Americans opposed restricting collective bargaining while 33% were for it. The poll also found that 56% of Americans opposed reducing pay of public employees compared to 37%. The details of the poll also stated that 26% of those surveyed, thought pay and benefits for public employees were too high, 25% thought too low, and 36% thought about right. Mark Tapscott of the Washington Examiner criticized the poll, accusing it of over-sampling union and public employee households. One explanation for loss of public support is simply the lack of union power or critical mass. No longer do a sizable percentage of American workers belong to unions, or have family members who do. Unions no longer carry the “threat effect”: the power of unions to raise wages of non-union shops by virtue of the threat of unions to organize those shops. Public approval of unions climbed during the 1980s much as it did in other industrialized nations, but declined to below 50% for the first time in 2009 during the Great Recession. It is not clear if this is a long term trend or a function of a high unemployment rate which historically correlates with lower public approval of labor unions. Another factor argued by both sides is business interests and supporters work together to undermine, challenge and campaign against unions and the benefits by "corporatizing" its leadership by calling union leadership "bosses". Drawing parallels between what a worker views an employer or "boss" being responsible for a less than satisfactory work life and the union being equal partnership in that dissatisfaction, may contribute to loss of faith in unions. A historical comparison of union membership as a percentage of all workers and union support in the United States. Although most industrialized countries have seen a drop in unionization rates, the drop in union density (the unionized proportion of the working population) has been more significant in the United States than elsewhere. Dropping unionization rates cannot be attributed entirely to changing market structures. In fact, scholars have shown the tremendous complexity inherent in explaining the decline of union density. 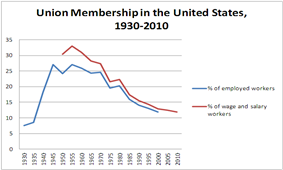 Rise and fall of union membership in the United States. In the US, labor education programs such as the Harvard Trade Union Program  created in 1942 by Harvard University professor John Thomas Dunlop sought to educate union members to deal with important contemporary workplace and labor law issues of the day. The Harvard Trade Union Program is currently part of a broader initiative at Harvard Law School called the Labor and Worklife Program that deals with a wide variety of labor and employment issues from union pension investment funds to the effects of nanotechnology on labor markets and the workplace. At the apex of union density in the 1940s, only about 9.8% of public employees were represented by unions, while 33.9% of private, non-agricultural workers had such representation. In this decade, those proportions have essentially reversed, with 36% of public workers being represented by unions while private sector union density had plummeted to around 7%. The US Bureau of Labor Statistics most recent survey indicates that union membership in the US has risen to 12.4% of all workers, from 12.1% in 2007. For a short period, private sector union membership rebounded, increasing from 7.5% in 2007 to 7.6% in 2008. However, that trend has since reversed. In 2013 there were 14.5 million members in the U.S., compared with 17.7 million in 1983. In 2013, the percentage of workers belonging to a union was 11.3%, compared to 20.1% in 1983. The rate for the private sector was 6.7%, and for the public sector 35.3%. Union membership had been declining in the US since 1954, and since 1967, as union membership rates decreased, middle class incomes shrank correspondingly. In 2007, the labor department reported the first increase in union memberships in 25 years and the largest increase since 1979. Most of the recent gains in union membership have been in the service sector while the number of unionized employees in the manufacturing sector has declined. Most of the gains in the service sector have come in West Coast states like California where union membership is now at 16.7% compared with a national average of about 12.1%. Historically, the rapid growth of public employee unions since the 1960s has served to mask an even more dramatic decline in private-sector union membership. Unions report that, under the present system, many employers use the 45 to 90 day period to conduct anti-union campaigns. Some opponents of this legislation fear that removing secret balloting from the process will lead to the intimidation and coercion of workers on behalf of the unions. During the 2008 elections, the Employee Free Choice Act had widespread support of many legislators in the House and Senate, and of the President. Since then, support for the "card check" provisions of the EFCA subsided substantially. Unions are currently advocating new federal legislation, the Employee Free Choice Act (EFCA), that would allow workers to elect union representation by simply signing a support card (card check). The current process established by federal law requires at least 30% of employees to sign cards for the union, then wait 45 to 90 days for a federal official to conduct a secret ballot election in which a simple majority of the employees must vote for the union in order to obligate the employer to bargain. The NLRA goes farther in protecting the right of workers to organize unions. It protects the right of workers to engage in any "concerted activity" for mutual aid or protection. Thus, no union connection is needed. Concerted activity "in its inception involves only a speaker and a listener, for such activity is an indispensable preliminary step to employee self-organization." Members of labor unions enjoy "Weingarten Rights." If management questions the union member on a matter that may lead to discipline or other changes in working conditions, union members can request representation by a union representative. Weingarten Rights are named for the first Supreme Court decision to recognize those rights. Right-to-work statutes forbid unions from negotiating agency shops. Thus, while unions do exist in "right-to-work" states, they are typically weaker. The employer and the union write the terms and conditions of employment in a legally binding contract. When disputes arise over the contract, most contracts call for the parties to resolve their differences through a grievance process to see if the dispute can be mutually resolved. If the union and the employer still cannot settle the matter, either party can choose to send the dispute to arbitration, where the case is argued before a neutral third party. Once the union has won the support of a majority of the bargaining unit and is certified in a workplace, it has the sole authority to negotiate the conditions of employment. However, under the NLRA, if a minority of employees voted for a union, those employees can then form a union which represents the rights of only those members who voted for the union. This minority model was once widely used, but was discarded when unions began to consistently win majority support. Unions are beginning to revisit the "members only" model of unionism because of new changes to labor law which unions view as curbing workers' ability to organize. A review conducted by the federal government on pay scale shows that employees in a labor union earn up to 33% more income than their nonunion counterparts, as well as having more job security, safer and higher-quality work conditions, and additional benefits. The median weekly income for union workers was $943 in 2012, compared with $742 for nonunion workers. To join a traditional labor union, workers must either be given voluntary recognition from their employer or have a majority of workers in a bargaining unit vote for union representation. In either case, the government must then certify the newly formed union. Other forms of unionism include minority unionism, Industrial Workers of the World, which do not always follow traditional organizational models. Private sector unions are regulated by the National Labor Relations Act (NLRA), passed in 1935 and amended since then. The law is overseen by the National Labor Relations Board (NLRB), an independent federal agency. Public sector unions are regulated partly by federal and partly by state laws. In general they have shown robust growth rates, for wages and working conditions are set through negotiations with elected local and state officials. The unions' political power thus comes into play, and of course the local government cannot threaten to move elsewhere, nor is there any threat from foreign competition. Today most labor unions in the United States are members of one of two larger umbrella organizations: the AFL-CIO is especially concerned with global trade and economic issues. Republicans, using conservative think tanks as idea farms, began to push through legislative blueprints to curb the power of public employee unions as well as eliminate business regulations.